Researchers of the Universities of Bern and Zürich and of ETH Zürich show how Jupiter was formed. Data collected from meteorites had indicated that the growth of the giant planet was delayed for 2 million years. Now, the researchers have found an explanation: Collisions with kilometer-sized rocks generated high energy, which meant that in this phase, hardly any accretion of gas could take place, and the planet could only grow slowly. With an equator diameter of around 143,000 kilometers, Jupiter is the largest planet in the solar system and has 300 times the mass of the Earth. The formation mechanism of giant planets like Jupiter has been a hotly debated topic for several decades. Now, astrophysicists of the Swiss National Centre of Competence in Research (NCCR) PlanetS of the Universities of Bern and Zürich and ETH Zürich have collaborated to explain previous puzzles about how Jupiter was formed. The research results were published in Nature Astronomy. 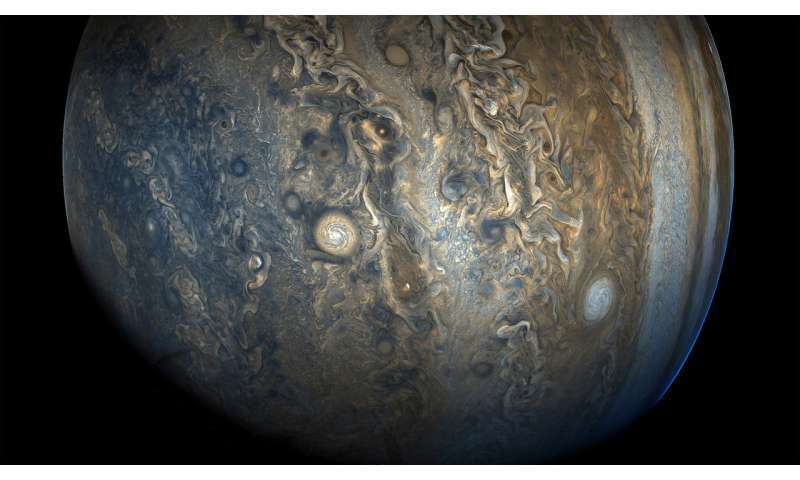 "We could show that Jupiter grew in different, distinct phases," explains Julia Venturini, postdoc at the University of Zürich. 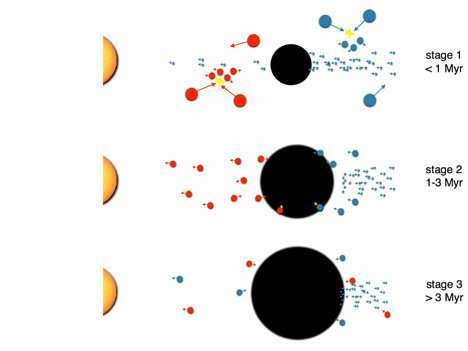 "Especially interesting is that it is not the same kind of bodies that bring mass and energy," adds Yann Alibert, Science Officer of PlanetS and first author of the paper. First, the planetary embryo rapidly accreted small, centimeter-sized pebbles and quickly built a core during its first million years. The following 2 million years were dominated by slower accretion of larger, kilometer-sized rocks called planetesimals. They hit the growing planet with great energy, releasing heat. "During the first stage, the pebbles brought the mass," Yann Alibert explains. "In the second phase, the planetesimals also added a bit of mass, but more importantly, they brought energy." After 3 million years, Jupiter had grown to a body of 50 Earth masses. The third formation phase was dominated by runaway gas accretion, leading to a gas giant with more than 300 Earth masses. The new model for Jupiter's birth matches new meteorite data presented at a conference in the U.S. last year. At first, Julia Venturini and Yann Alibert were puzzled when they heard the results. Measurements of the composition of meteorites showed that in the primordial era of the solar system, the solar nebula was divided into two regions over 2 million years. 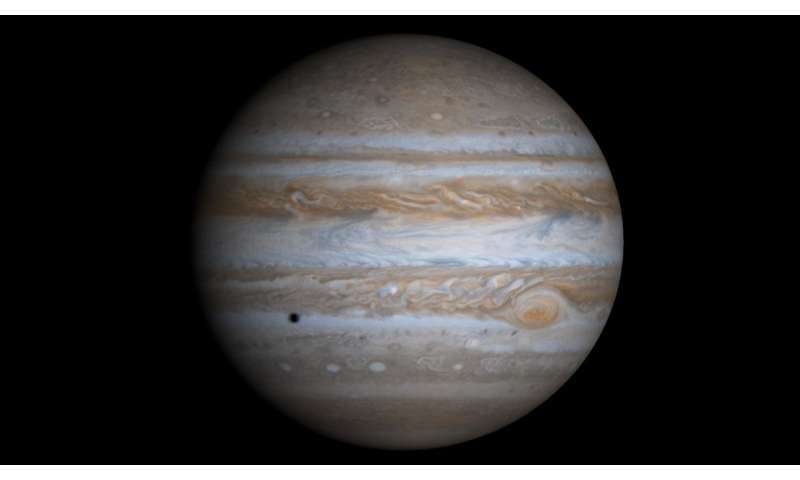 It could therefore be concluded that Jupiter acted as a kind of a barrier when it grew from 20 to 50 Earth masses. During this period, the forming planet must have perturbed the dust disk, creating an over-density that trapped the pebbles outside of its orbit. Therefore, material from outward regions could not mix with material of the inner regions until the planet reached sufficient mass to perturb and scatter rocks inwards. "How could it have taken 2 million years for Jupiter to grow from 20 to 50 Earth masses?" asked Julia Venturini. "That seemed much too long. That was the triggering question that motivated our study." A discussion via email began among NCCR PlanetS researchers of the Universities of Bern and Zürich and ETH Zürich, and the following week, experts in the fields of astrophysics, space chemistry and hydrodynamics arranged a meeting in Bern. "In a couple of hours, we knew what we had to calculate for our study," says Yann Alibert: "This was only possible within the framework of the NCCR, which links scientists from various fields." With their calculations, the researchers showed that the period during which the young planet had a mass in the range of 15 to 50 Earth masses was much longer than previously thought. During this formation phase, the collisions with the kilometer-sized rocks provided enough energy to heat the gaseous atmosphere of the young Jupiter and prevented rapid cooling, contraction and further gas accretion. "Pebbles are important in the first stages to build a core quickly, but the heat provided by planetesimals is crucial to delay gas accretion so that it matches the timescale given by the meteorite data," the astrophysicists wrote. They are convinced that their results provide key elements for solving other longstanding problems regarding the formation of Uranus and Neptune and the exoplanets in this mass regime. How does this tie into the Nice Model and the 'Big Tack' ?? It still looks like a Van Gogh painting to me with all those swirls. That comes after, when Saturn has grown large too.